The PAT testing handbook, written by Seggy T. Segaran in combination with PASS, is a unique content portable appliance testing handbook and is an ideal investment for all PAT technicians. All the everyday PAT testing examples are written in an easy to understand and read language register, making the information much more valuable. This PAT handbook emphasises and uses the IEE Code of Practice, includes photographic examples and colour coded sections for convenience and ease of use. 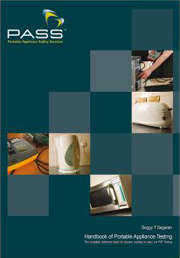 The PAT testing examples and the useful appendix at the back of this PAT testing handbook are invaluable for easy reference. For new PAT technicians this resource is a must buy, for more experienced technicians it is an extremely useful guide. Chapter 1: Why do we have to PAT Test? Chapter 7: How often do you maintain equipment?